The other day I was listen to a song on the radio which had a part where the voices slow down, it was meant to be like that but I giggled to myself and though aaahhh that sounds just like my old Sony Walkman when the batteries started running out. Its times like that you realise how much has passed you by and how much things have changed. Not that I am by any means old, nor do I feel it. But life and technology are a million miles away from what they were when I was in my teens. The other day in College I mentioned Chips, an American Cop programme I used to watch when I was younger, to some of my students. Everyone just looked at me blank they had no idea what I was talking about! So I have decided to write a few posts, a trip down memory lane of life in the 80s. I am starting today with technology as the differences from then, to now are vast. Firstly T.Vs, this is the exact TV we had at home I remember my Dad bringing it home, we all thought it was so posh. I can’t believe there was only four channels in the 80s, when channel 4 started in 1982 everyone went mad over it wow a new channel to watch. Kids TV was only on for a couple of hours a day on two channels. I shall tell the Boys this next time they are moaning about there being nothing on TV on the 100 plus channels we have today. We also had a remote control but it was wired ha ha that seems so funny now, I remember we had to leave it in the middle of the lounge floor as the lead was not very long and take turns getting up to use it. I mean really what was the point of that! My trusty Sony Walkman, I had the exact one above, I remember we were on Holiday in Jaywick, Clacton and whilst we were there I celebrated my 12th birthday. My Mum and Dad took me to Clacton Market to choose a Walkman I was so proud of it. I used to have to carry spare batteries with me as when they started to run down the music went slow. And below is a cassette tape I used to put into it, the boys didn’t even know what this was. 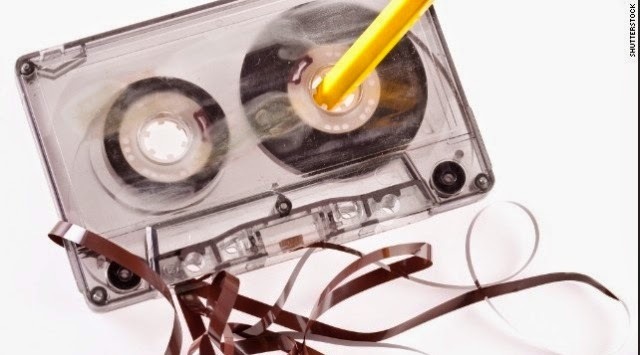 Like in the picture sometimes the tape came out in your walkman usually when the batteries were low, you would have to carefully release the tape and wind it back in with a pencil. Oh how easy I pod use is today. Below is a picture of the exact record player I had, I loved it I remember plugging it in the porch and putting it on the door step so I could dance in the front garden with all my friends on the street. Ah that brings back such happy memories. The Apple computer, my Auntie Maureen had one of these, I used to love going to her house to play with it, it was amazing it felt so cutting edge. I would never have believed as that 12 year old that computers could do what they do now. The not so mobile phone, can you believe people carried these around thinking they were cool, when I tell my students who are mobile phone obsessed, that it was not an option for a teenager to have a phone when I was younger, they just do not believe me. The Soda Stream, Fizzy drinks were not as accessible in the 80s. It was a treat to have a Cola on a visit to the pub for lunch. So when my Mum bought the soda stream, my brothers and I went mad, I think we used all the gas on the first day, I am surprised we didn’t pop. It felt like such a luxury, wow fizzy drinks at home. I remember there also used to be a man drive round the streets called a Bilco man who used to sell fizzy drinks. As a treat my Mum and Dad would buy cream soda and put a scoop of ice cream in it mmmm. Le Clic Camera, I have always loved taking photos and loved my pink Le, Clic camera I took it everywhere, the problem in those day is you had to get your films developed and I don’t think it was cheap in the 80s. Funny I showed this picture to the boys and they had no idea what it was. My last one is for the Boys, I have never been into gaming really but I remember my brother Stephen getting an Atari for his birthday one year, he loved it and spent hours in his bedroom. I do remember playing games on it. I once played it for so long I dreamt about it all night. I cant believe looking back how primitive the games are compared to todays games which look like TV or film. Well, my trip down technology memory lane is over,I think I have gone on a bit. This was meant to be a post about the 80s but I got so giddy and found so many great images, that I have split it into categories music, fashion, T.V ,films, and toys. I know this is a tad self indulgent, but when you start looking back and recalling all those happy memories you want to enjoy them for a while. I am a real look forward in life, type of person. But I have thoroughly enjoyed my Sunday look back at 80s technology. I hope if the boys read this they will realise just how lucky they are, I mean really, four T.V channels. Previous Post 100 Happy Days, Day 61, A Beautiful Tree in the Miserable Rain. My parents used to own an electric shop, so we had all of these! The soda stream was a big event in our house, as was our first mirco-wave oven – that was the strangest thing ever, at the time. I remember my mum going to cooking demonstrations for meals you could make in the micro in minutes. She came home with a very dodgy looking chocolate cake. Love the 80s!! Thanks for the trip down memory lane. I had a red Sony Walkman just like that and was forever making mix tapes that it would promptly wreck. Oh how I love the iPod Shuffle! !